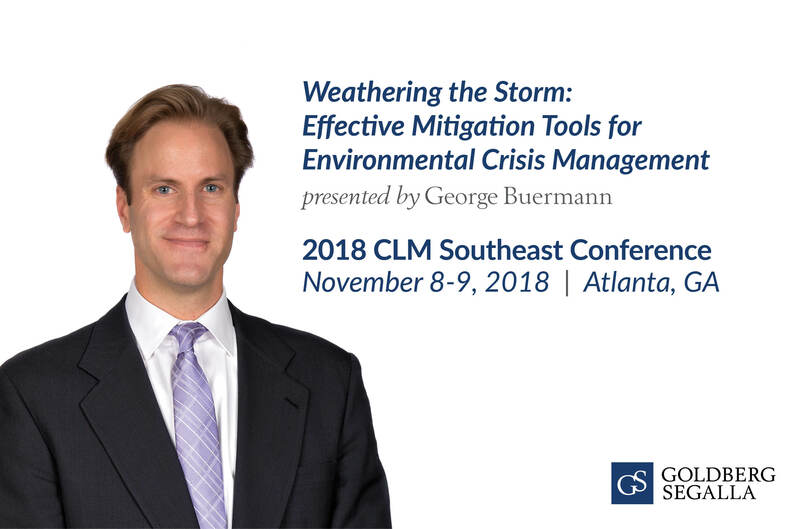 Join Goldberg Segalla’s George Buermann on November 9 at the 2018 CLM Southeast Conference in Atlanta, GA. George will be part of a panel discussion titled, “Weathering the Storm: Effective Mitigation Tools for Environmental Crisis Management.” The panel will discuss the actions insurers and businesses can take to shift their posture from being reactive to a preplanning and preventative stance as well as ways to minimize and mitigate damages that arise from environmental disasters and emergencies. The panel will offer instruction on how to prepare before an environmental disaster hits, discuss issues that arise during the disaster-phase itself, and offer tips for the investigation phase immediately after the emergency. The CLM Southeast Conference is a two-day conference covering a range of environmental issues impacting the insurance industry.